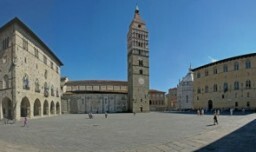 The Tuscan city of Pistoia was chosen out of nine finalists to be the Italian culture capital in 2017, Culture Minister Dario Franceschini has announced. The other finalists were Aquileia, Como, Ercolano (Herculaneum), Parma, Pisa, Spoleto, Taranto and Terni. Pistoia will thus succeed the current Italian culture capital, the Lombard city of Mantua. “I believe we were selected for (our) idea that culture is the first right of citizens,” said Mayor Samuele Bertinelli. “Pistoia invests in culture more than double the national average”. The city plans to invest over 15 million euros – plus six million euros in operating expenses – to revamp urban areas and cultural infrastructure.